This section describes some common problems you may encounter when trying to connect to server.war2.ru. If you can’t connect try checking the status page to make sure the server isn’t offline. If it is you can switch to a backup server while you wait for the main to come back up. When you double click the War2combat icon it gives you a pop up saying “Connection to server.war2.ru failed, please check you network connection, firewall and try again”. This message appears when War2PLoader (part of the anti-hack system) can’t establish a connection to the server, usually because server.war2.ru is down. Click on “Ignore” and the game will launch as usual; if you want to play online you’ll also need to switch to a backup server until the main server is back online. 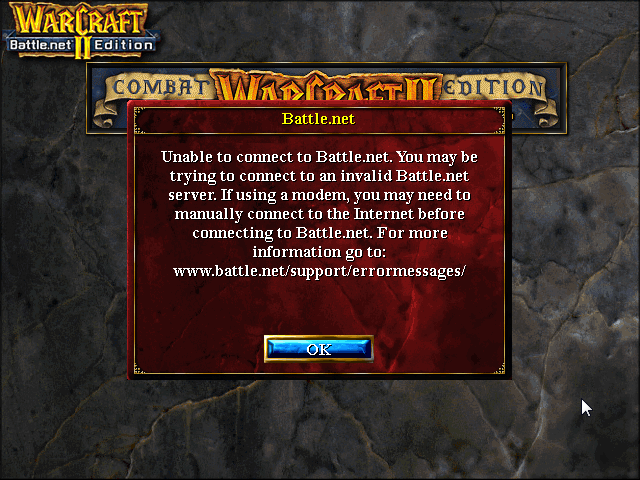 When attempting to connect to Battle.net under the “Multi player game” section of the main menu, the War2.ru server is not available in the dropdown list of gateways. 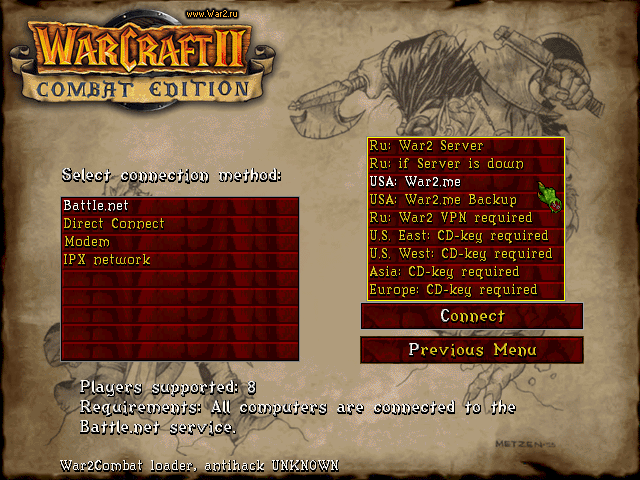 If you aren’t using our custom Warcraft II client (War2Combat) then our server won’t be in the gateways list, for example if you have an originalWarcraft II: Battle.net Edition CD or a pirated Warcraft 2 BNE .iso file. The solution is to edit your registry to add our server (server.war2.ru) to the list. Solution #1: Download & install the latest version of War2Combat which will automatically add our servers. Solution #2: Download and run this registry file to automatically add our servers. Solution #3: Follow this tutorial to manually add our servers using the Gateway Editor app. After you click connect the logon process proceeds normally until “Checking versions”, then hangs indefinitely. This problem sometimes happens as a result of a memory overflow on the server. The server isn’t technically “down” and you may see some people still connected on our status page, but no additional players can log in. The problem is usually fixed quickly; if it happens to you just check back later to see if the server’s back online, and switch to one of our backup servers if you want to play in the meantime. This is usually a temporary problem that happens when your Internet connection is very slow. 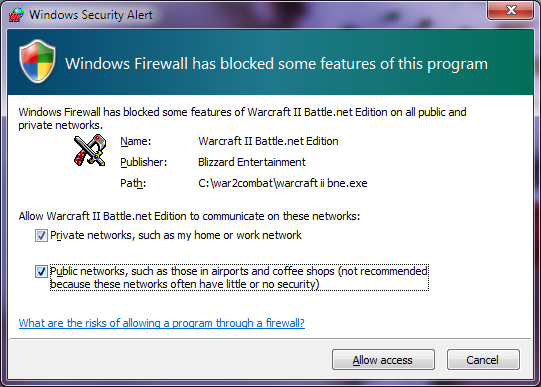 If it persists indefinitely try checking your firewall inbound rules to see if WC2 is being blocked. If you aren’t comfortable changing the settings you can delete the rules, then look for this prompt the next time you log on to the server and check both boxes. This problem happens when the server is offline, and has specifically been known to occur when the server is being hit by a DDoS attack. All you can do is check back later to see if the server’s back online, and switch to one of our backup servers in the meantime. 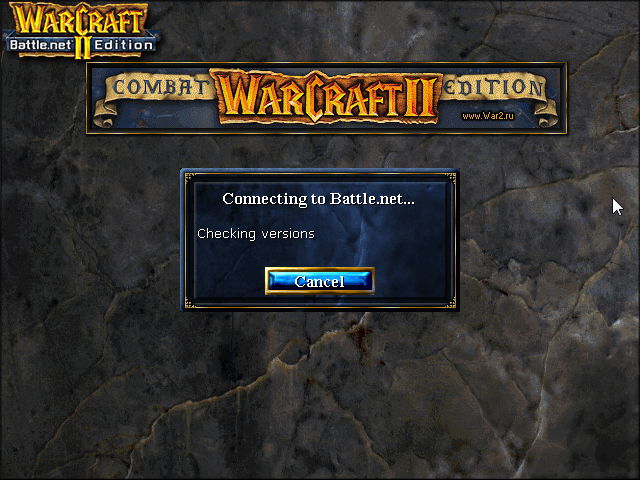 When you select server.war2.ru in the gateways list and click on “Connect” the “Connecting to Battle.net…” dialog appears for a split second then you immediately get kicked back to the gateways menu. This can happen for several reasons, however the most common is that your IP address has been banned from the server. If you have not to your knowledge broken any of our rules (for example, hacking or failing to provide a screenshot on request) then it’s possible that we’ve banned a range of IPs that happened to include yours. In this case it’s best to contact us about it so we can evaluate the situation and discuss a possible resolution. Hello, I’m trying to connect to the server but can’t seem to despite the fact that it was working a few days ago. When I click on the war2combat icon on my desktop it doesn’t connect and just comes up with a message saying “connection to server.war2.ru failed, please check you network connection, firewall and try again”. There is nothing the matter with my network connection and I haven’t done anything with my firewall as of lately. I’ve tried restarting my computer, restarting my internet hub, I’ve even reinstalled war2combat from this website but nothing seems to be making it work again. Does anyone know how to solve this problem, I would be very grateful if you could let me know how. Hi Johno, sorry for the trouble. The main server is currently down which is why you can’t connect. Most people have been playing on the War2.ru Backup server & the War2.me (“Mousetopher”) servers in the meantime. Check out this article that explains how to switch servers. Hey its me SaulGood. I’ve been playing with you guys for years but now I’m having an issue. My computer automatically updated to windows 10 (still don’t know why I didn’t ask it to) but anyway now I can’t play. When I double click the icon on my desktop everything is fine until it actually starts connecting and then the words are are garbled and the icons buttons don’t have any words on them. I can log in and get to the main screen but I can’t see any player, nor comments, nor games. I can get there but everything is all fucked up and weird looking. Any ideas whats going on? Hi Saul, I already followed up with you on this, but email me back if you want me to help you apply the fix, it only takes a second! Hi, I have the same problem with windows 10, Could you please tell me the solution to fix this? Hello thank you for the previous response, I have another problem at the moment, I’m trying to play a network game with someone and although he can access the server, the display is not right it seems to be zoomed in on the top left to some extent, do you know how to solve this problem he is using windows 10.
when i try to download the war2 combat, I get an error “war2combat\cmdmpq.exe”. Can you help me here? Hey Mousetopher, I get this message when i try to launch the game. guys its XtiC-fUri aka Strata-G .. I got a new laptop installed the latest ver but I cant get pass the beginin load screen of the game where it shows A footie an a grunt staring at eachother the beignin wallpaper of the game loading.. any info on this?